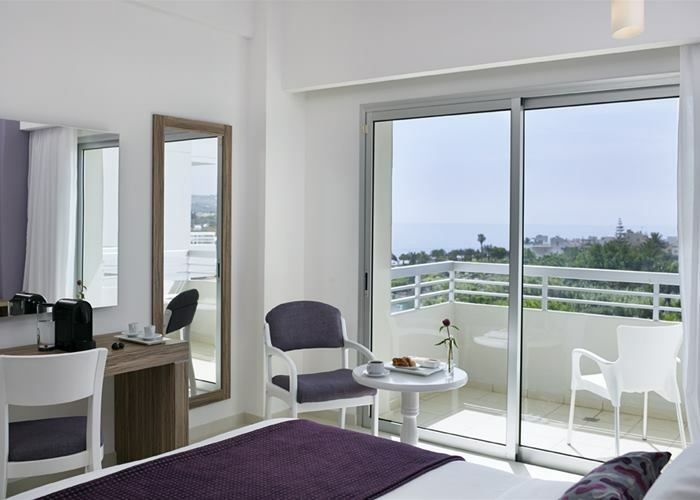 Set within a peaceful location on the South East coast of Cyprus and with a beachfront spot, it's well maintained gardens create the perfect area to soak up the Mediterranean sun. This hotel is exclusive to adults, creating a relaxing environment that is made even more perfect by combining the top food and drink on offer. The hotel is ideal for couples above the age of 16 years old. There's a modern and spacious feel to these rooms that sleep up to 3. You'll find a comfortable double bed or twin beds and a balcony as well as other essentials like mini fridge, LCD TV and air conditioning. There's a modern and spacious feel to these rooms that sleep up to 3. 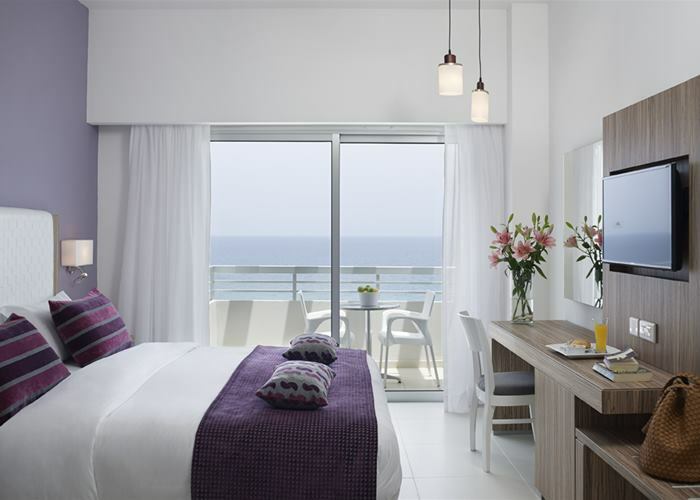 You'll find a comfortable double bed or twin beds with a balcony that enjoys a side sea view. In addition there will be other essentials like mini fridge, LCD TV and air conditioning. 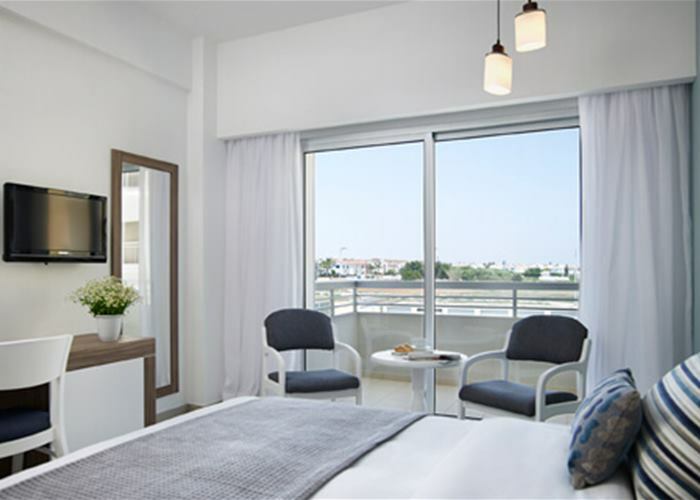 A beautifully furnished room with an elegant decor and balcony. 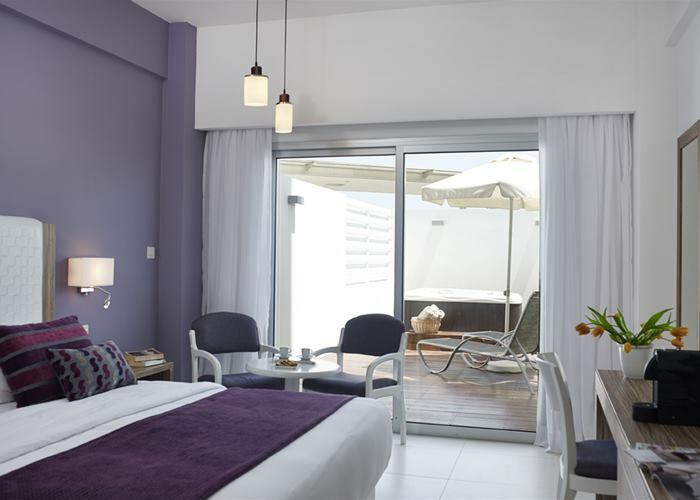 These rooms come with a double bed or twin beds and sleep up to three. A welcome of fruit & wine await your arrival along with the included bathrobes & slippers, mini fridge, LCD TV and air conditioning. 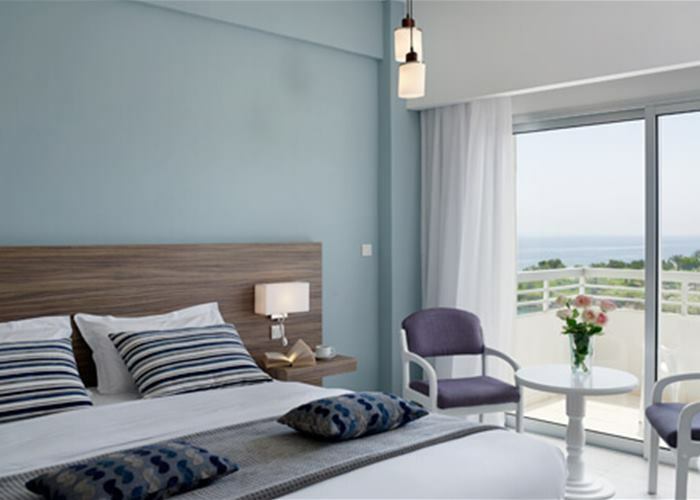 A beautifully furnished room with an elegant decor and balcony with a side view to the sea. 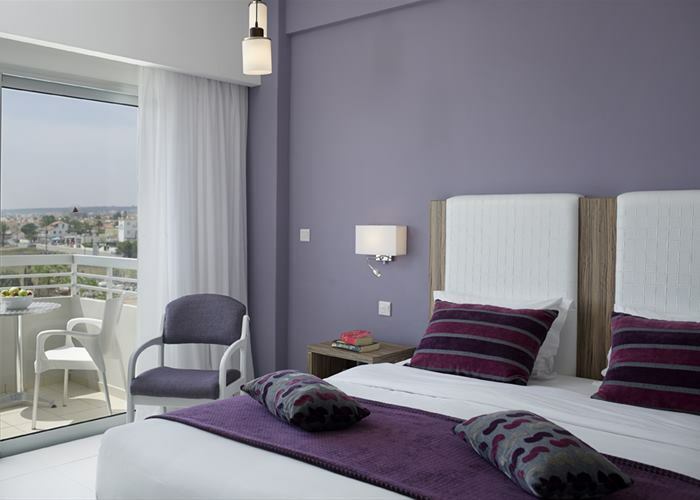 These rooms come with a double bed or twin beds and sleep up to three. A welcome of fruit & wine await your arrival along with the included bathrobes & slippers, mini fridge, LCD TV and air conditioning. 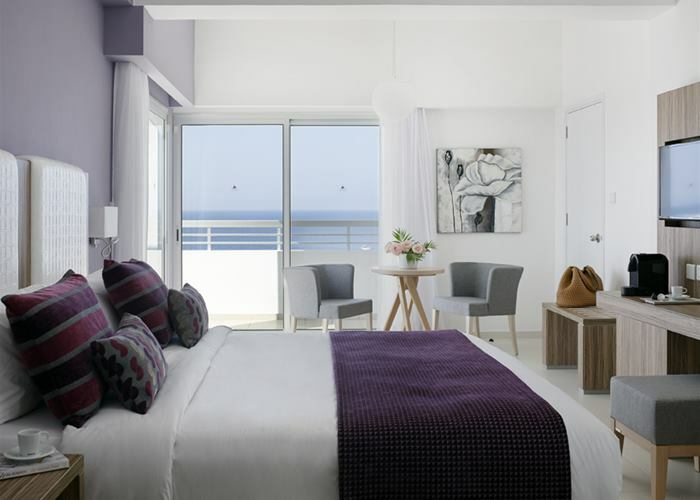 A beautifully furnished room with an elegant decor and balcony overlooking the sea. These rooms come with a double bed or twin beds and sleep up to three. A welcome of fruit & wine await your arrival along with the included bathrobes & slippers, mini fridge, LCD TV and air conditioning. 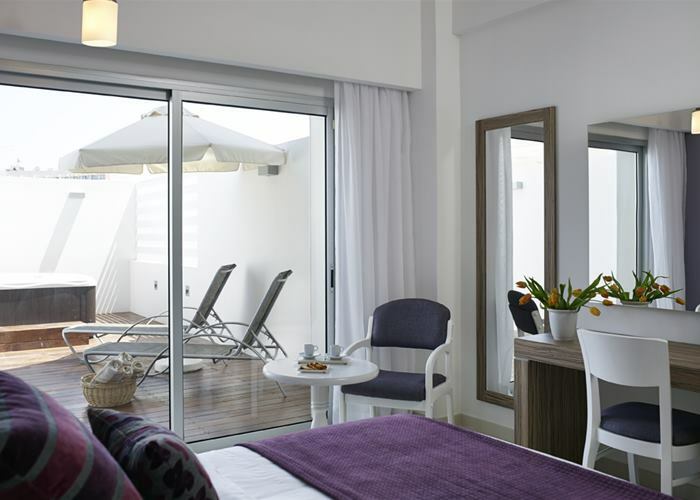 These modern rooms offer spacious living and lead on to the enclosed terrace complete with private jacuzzi and sun loungers. Rooms sleep up to 3 with a double bed or twin beds. A welcome of fruit& wine await your arrival along with the included bathrobes & slippers, mini fridge, LCD TV and air conditioning. 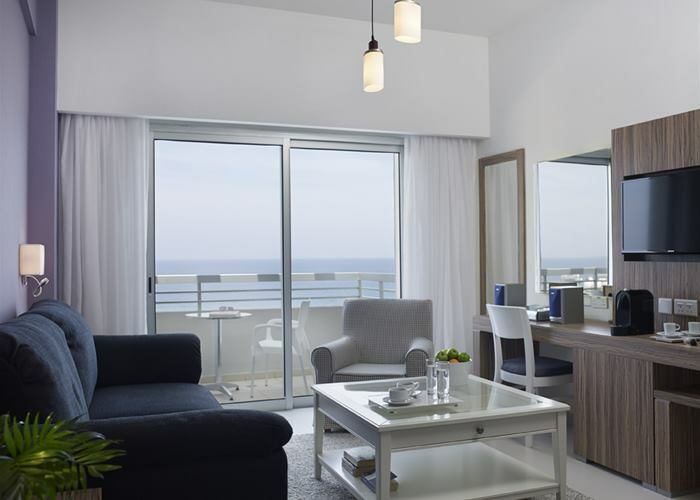 There’s a real hint of class within these spacious suites with bedroom and separate lounge, both with balconies overlooking the sea. Sleeping up to 3 adults, the suites come with a double bed or twin beds, two bathrooms one with shower and the other with bathtub. There's a welcome of fruit & wine as well as bathrobes & slippers, mini fridge, LCD TV and air conditioning.